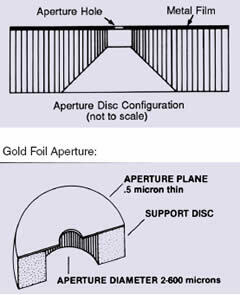 Advanced techniques of thin metal film application permits the apertures to retain a clean hole edge during prolonged beam exposure. Ultra-thin, half-micron design discourages contaminant accumulation and stabilizes astigmatic conditions to provide longer life. Conventional mechanical cleaning involving costly down-time is no longer necessary. Because the foil is ultra thin, care must be taken when handling the gold foil apertures. Platinum apertures are easily cleaned by either an aperture flamer or over a bunsen burner in the open air. We maintain a wide variety of Platinum Drilled Apertures in stock with different configurations suiting all of your needs. Hole Sizes not listed are available upon special request. All the following multihole strip aperture are made from Platinum-Iridium (95:5) and are standard in our line. Note: These are our standard strip apertures. For all other strip apertures or any custom made ones please inquire. For aperture cleaning, vacuum evaporation. For holding aperture discs or strips while flaming. Small discs can be flamed in the 3/16" diameter cup made from 6 mil platinum foil with a 1/32" diameter hole in the bottom to induce a good flow of air. The cup is attached by a 30 mil platinum wire to a heat resistant handle. The aperture can be hung from the hook for flaming. For holding ¼" to ½" diameter aperture discs while flaming. The flat pan is made from 6 mil platinum foil with a 1/32" diameter hole in the bottom to induce adequate air flow. A 30 mil platinum wire attaches the pan to a heat resistant handle.